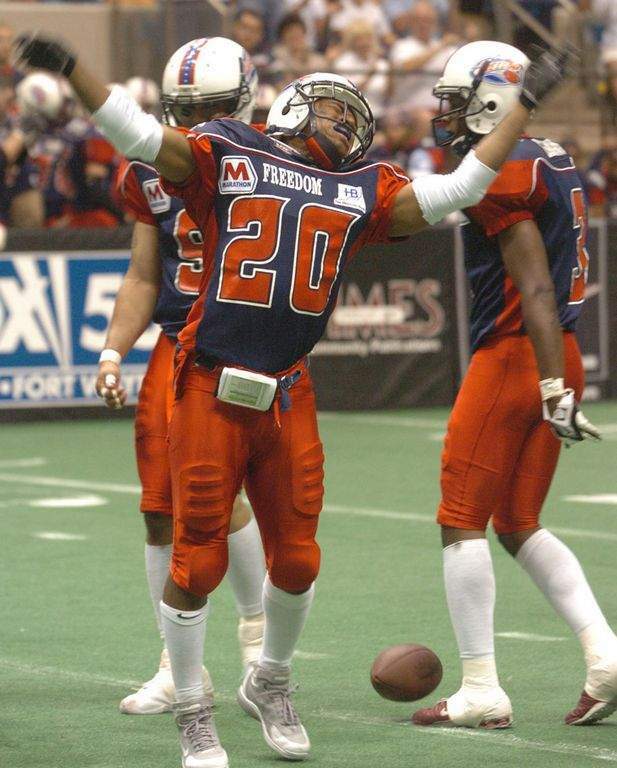 FILE: A player celebrates a 35-yard punt return for the Fort Wayne Freedom in 2005. A three-year contract to bring the Indiana Blue Bombers of the fledgling National Gridiron League to Memorial Coliseum was approved Wednesday. Fort Wayne, are you ready for some football? It's official: Indoor football, also known as arena football, is coming back to Fort Wayne. A three-year contract to bring the Indiana Blue Bombers of the fledgling National Gridiron League to Memorial Coliseum was approved Wednesday by the facility's board of trustees – after nearly a year of negotiations and pro and con rumors among area sports fans. According to the agreement, the team will play eight games of a 16-game season at the Coliseum beginning in March. Randy Brown, Coliseum executive vice president and general manager, said the last time indoor football graced the local building was nearly a decade ago. The Coliseum agreement stipulates the team will be rewarded with lower rental fees when attendance meets certain thresholds. If attendance is under 4,000, the rent will be $2,500 per game. If attendance is between 4,000 and 5,000, rent will be $1,500 per game; if above 5,000, rent will be free. The agreement also stipulates the league will maintain turf and other equipment needed for games. Brown said the Coliseum previously was home to four indoor football teams with varying degrees of success. The National Indoor Football League's Freedom franchise held games at the facility from 2003 to 2006. The Fusion of arenafootball2 folded after one season. In 2009, a reincarnated Freedom reached the championship game of the Continental Indoor Football League. That league also had the Firehawks, which folded in 2010. Early on, games attracted 6,000 or more spectators, and the second iteration of the Freedom “was a pretty good team,” Brown said after the unanimous vote. The Blue Bombers are in a league in its first year – “a risk,” Brown said, because there is no track record. On the other hand, he said, that fact may represent a chance for the Coliseum to get in on the ground floor of an up-and-coming trend. “The opportunity was there now,” he said. Brown said the new league, headquartered in Jacksonville, Florida, has a single ownership structure for all the teams. That should give it an advantage by keeping teams from acting against each other's interests, and a single ownership also makes it easier to secure sponsorship and licensing agreements. The chairman of the league is Joe McClendon. Coaching the new team will be Kelvin Kinney, who has played with the NFL's Washington Redskins, coached in the Canadian Football League and been affiliated with the XFL. A roster of players is at www.indianabluebombers.com. The Blue Bombers will be part of the league's Eastern Conference. The league has 12 teams in two conferences. Cities hosting the league include Evansville, Norfolk and Roanoke in Virginia and Wilkes-Barre, Pennsylvania. The league's website says games will be played Fridays, Saturdays and Sundays. The season runs March 15 to July 31 and includes playoffs. “We've had a good history with football,” Brown told The Journal Gazette. He said the facility was interested in re-engaging with the sport to diversify programming and increase the number of days the Coliseum is used.